Bible Point: The Bible never mentions the word, trinity or Triune God. However, there are plenty of references in the Bible about the three personalities of God: the Father, Jesus the Son, and the Holy Spirit. Many of these references, these names of God, are used interchangeably. To better understand the Trinity, and how God can be three-in-one, we will make Trinity Bread Sticks. What You Need: Bread stick dough, Cinnamon Sugar, parchment paper, plastic knife. What You Do: Give each child a piece of parchment paper, a plastic knife, and one bread stick dough. Cut dough into thirds. Roll out the three sections to twice their length. Pinch one end of the dough together and braid it. Pinch the other end of dough together. Sprinkle with cinnamon sugar and bake according to package directions. The children will discover that the three pieces of dough have become one. If you like this idea, then you'll love the other fun activities in the book, His Name Shall Be Called . . . 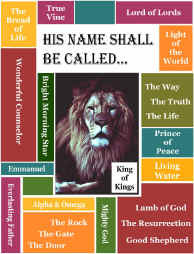 Lessons For Children On The Names of God.